Surveys show that around half of people in the UK pray. At least a bit. So that includes lots of people who wouldn’t call themselves Christian or even religious. That reminds us that there’s an aching and longing in the human heart not only to call out to God, but to know God. For the follower of Jesus, prayer is crucial because Jesus prayed, showed his disciples how to pray and told us to pray. Indeed, praying in his name is probably the distinguishing characteristic of the Christ-follower. I often tell people that nothing of lasting significance happens without prayer. If you want to make a lasting difference in world, you must pray. You must call out to The Lord. You must spend time time with him. Living in relationship with him. And giving quality time to him. That’s how the relationship grows and thrives. In the book of James – we read that ‘the prayer of a righteous person is powerful & effective’ (5:16). I don’t know about you, but I want my prayers to be like that! But prayer is not something we just do on our own. There are great benefits of praying together. 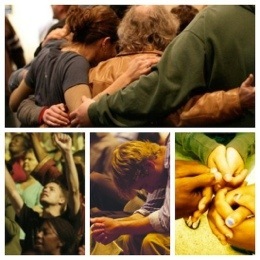 I’ve been in all sorts of prayer gatherings over the years. At different times. In different places. Of different shapes and sizes and styles. To be honest, some have been a bit tedious. And some amazing. I’ve been in prayer meetings sat next to people with terribleness dog-breath; where people have broken wind; where people have been loud and others silent; where people have wept and laughed and danced and pogoed and laid on the floor and knelt down. (But not normally at the same time, or in the same meeting!) No doubt I have more to experience and learn. But in the midst of all I have observed and participated in, one of my big questions is this: does it make a difference? So from this passage David Watson says there are the 3 keys to prayer that makes a difference. What are they? The dynamics of praying with others are very different to when I pray on my own. There’s always a special sense of God’s presence as we pray together. In some parts of the world they know this so well that they’re willing to risk imprisonment for the sake of meeting together to pray. That’s why the church staff pray each morning together. That’s why at The Belfrey we have weekly prayer gatherings, like Tuesday 7am Dynamic Prayer, and our twice-termly Evenings of Prayer. Praying together is really important. These early Christian knew who they were praying to – and so should we. And before they touched on their problems, they turned to God. The God of Scripture. They got their bibles out (either literally, or from memory) and they used Scripture to focus on the nature of God as they lifted up their voices to the God who is sovereign. The God who is in charge. The boss. ‘The Lord’ (as I blogged about a couple of weeks ago). They saw that the God of Scripture was in charge over everything – starting with creation, and including the recent crucifixion of Jesus Christ. And this helped them pray believingly. With faith. That’s why we normally start prayer by hearing from God’s word – the bible. If find that helpful too in my my own personal praying. It helps to begin by focussing on the Sovereign Lord. In this story, these disciples asked for i) help to speak the word boldly, and ii) God to heal and do signs and wonders. That’s interesting, given that Peter and John had just been treated aggressively by the Jewish authorities and told not to speak in the name of Jesus. They were probably shaken and frazzled. If it had been me I’d have probably prayed for protection. But that’s not what they do. Instead they pray for ‘great boldness’! And for God’s power to be released in miracles. Is that the kind of thing we pray for? When they do this God reminds them that he’s with them by shaking the building. I’ve known the power of God to come as we pray. I recall a prayer meeting I was leading as a teenager with some other young people one Pentecost Sunday. As it was a day celebrating the coming of the Holy Spirit I thought it would be good to ask him to come again. And as I prayed (sitting down) I was almost knocked off my chair as the presence of God came. It was not what I was expecting at all! However I have yet to be in a prayer meeting where the actual house shakes. I look forward to that day! But more important than the shaking was the result – the fruit. That’s what we should be really looking for when we powerfully experience God’s presence – the difference it makes. Here in Acts 4 they were strengthened and spoke more boldly. Which is what they’d specifically prayed for. And it’s the same for us. God loves to answer prayer – particularly specific prayer. Amongst other things we prayed specifically at The Belfrey’s last Evening of Prayer for £50,000 for a Gift Day and so were thrilled and thankful to God when more than that amount came in the following week! Yesterday I received an email from someone who told me about a specific answer to prayer linked to that. They’d decided to give 10% of the money in a savings account for the Gift Day and asked The Lord to provide for them. Since then they’ve received two lots of unexpectedly income which amount to the money they’d given away. They were very excited! Such is the power of specific prayer. So it seems to me that we need to take united prayer far more seriously than we do. We need to focus on the One to whom we’re praying (and pray with a bible close by) with a faith rekindled by the power of God’s word. And we mustn’t be afraid to ask God for what is needed. And then step out and be part of the answer to those prayers. Next Next post: Is the Church like M&S?